Started to be worn during the Qing Dynasty (1644-1911 AD), Chinese dresses are also called qipao or cheongsam. Movie stars and upper-class ladies helped it reach extreme popularity during 1910s -1940s. 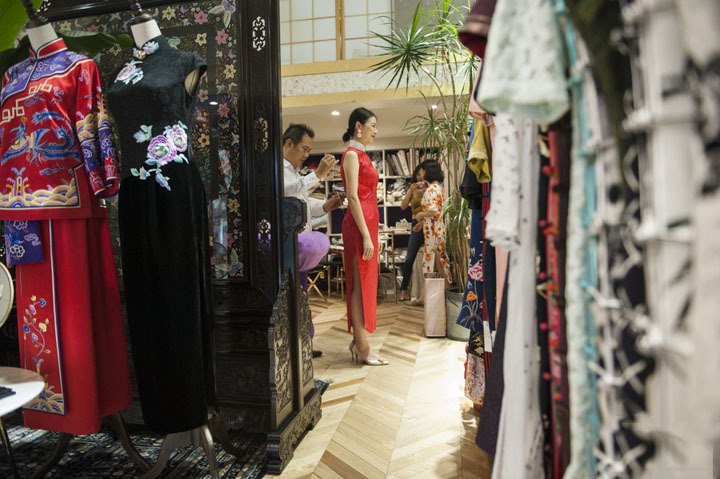 Generally it is now worn for formal occasions such as weddings, engagements, and on the Chinese New Year, but more and more casual qipao are crafted for everyday wear. Support international shipping, cozyladywear.com is an online cheongsam & qipao store that established in 2012's New Year. From a qipao studio to an online store, we offer thousands of cheongsam & qipao dresses, qun kwa, tang jacket and coat for different occasions including wedding ceremony, evening dress and casual everyday wear. Being huge chic qipao fashion lovers ourselves, our designers are committed to combining the modern fashion aesthetics and trends with traditional idea to create new fashions. Whatever your are a bridal who are planning a Chinese wedding ceremony, or a lady who is seeking a personalized dress for a party, whether a girl obsessed in orient culture, all you need is to explore at cozyladywear.com, and find your style. We also offer custom made service to design your own suits by choosing from a wide range of styles and fabrics. In 2017, some excellent designers joined us to provide handmade orient jewelry including earrings and hair accessories to complete chic qipao look for our customers.